The Indrahar Pass Trek in Himachal Pradesh begins from McLeod Ganj near Dharamshala and takes four days. It presents serene locations and lets you soak in the charm and freshness of mother nature. Breathtaking views of the Dhauladhar & Pir Panjal mountain ranges. Clear views of peaks like Moon Peak and Arthur’s Seat. Company of experienced and knowledgeable guides. Located at 4342 metres/14,245 ft, the Indrahar Pass is situated in one of Himalaya’s most famous mountain ranges- the Dhauladhar Mountain Range. The Indrahar Pass is located in a unique geological region, a major thrust zone of the Indian tectonic plates, i.e. where the pressure of the Indian tectonic plate pushing against the neighboring Eurasian tectonic plate, is the strongest. Narrow streams which ultimately join up with the Beas and Ravi Rivers run throughout the Indrahar Pass trekking route. The rich, opulent Kangra and Chamba Valleys also spread out far on either side of the route. The Indrahar Pass Trek offers climbers a rigorous ascent up the Dhauladhar Mountains. With slightly rocky terrain, steep ridges and wide chasms interspersed here and there with flat, plain land, the Indrahar Pass Trek is best suited for trekkers with some trekking experience. The dark, cool Lahesh caves en route to the Indrahar Pass are also worth a visit. You will have to report at our base camp in Mcleodganj by 10:00 am and after freshening up and change, you will start your trek towards Laka Got. After the initial 2 kilometers of a little steep hike, it is a gradual incline all the way to Laka. You will be covering a total of 15 km in this trek to Laka Got. You will be staying overnight in Laka Got. You will be starting early in the morning on the second day and depending upon the month we may find some snow on the trail. From Laka Glacier, it will take you about 3-4 hours to reach Indrahar Pass. Views from the Indrahar Pass are amazing and whole Pir Panjal range can be seen. After spending some time at the pass and having your lunch here, you will head back to Laka Got for the night. On the final day, you will be heading back following the same route you used while coming but if there is no snow then you may use a different route which goes directly to Triund. From Triund you will desecend down to Bhagsu Nag and further to Mcleodganj and reach our base camp at Mcleodganj by evening 4-5 pm. T-shirts, Trekking Pants, Windproof jacket preferably with a hood, Warm and thick Fleece, Full-sleeve Woolen sweater, regular socks (3-4 pairs), Scarf/muffler (optional), Comfortable Trekking/Hiking shoes (shoes with a thick sole are recommended), Lightweight floaters/sandals/slippers, Raincoat / Poncho, Small lightweight towel, Water bottle, Sunscreen Lotion, Cap to keep the strong sun away from your face, Sunglasses, Sunscreen Lotion, Lip Balm, Torch / Flashlight (with extra batteries), Medicines (if requiring any specific medication), Personal toiletries, Books, if you like reading, Daypack/small bag which you will carry on your back every day and keep your essentials in it, Camera with charged batteries. Please avoid carrying expensive watches, jewelry and electronic items on the trek. Select this option if you want to add extra one night stay in Base Camp, Mcleodganj before start of trek. Select this option if you want to add extra one night stay in Base Camp, Mcleodganj after the trek on Day 4.
Who will be the trek coordinator? An expert qualified Trek leader is assigned to lead every trek. Along with support staff, guides, cooks and porters accompany you during the trek. 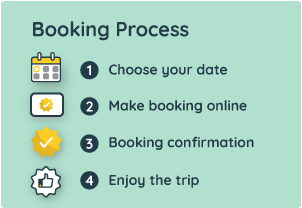 Post booking all details including trip coordinator details are shared on booking voucher on email and app. What kind of shoes do I need for this trek? Are any special snow shoes required? No, you do not need to buy any advanced snow shoes for this trek. All you require are a good pair of trekking shoes. You can opt for water resistant trekking shoes. Do carry along sufficient number of spare socks. Woolen socks are optional though.